Feeling crafty? Fancy doing something a little different this Halloween? Why not spice up your pumpkins by painting them with bright, bold and beautiful paints – perfect for the eclectic style home! 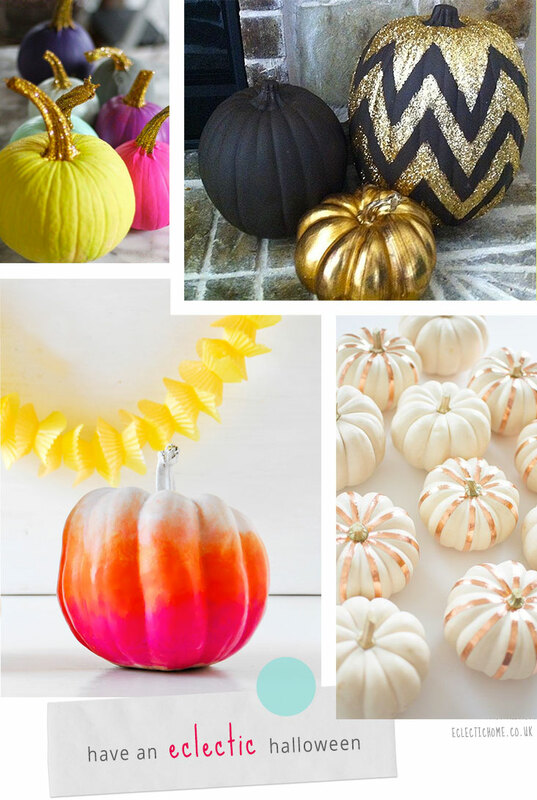 Bright & Glitter – These fun and colourful painted pumpkins feature glittered stems (and why not?) Admittedly, there’s nothing spooky about them, but I cannot say no to the eclectic mix of colours on display. Find the tutorial over at AuntPeaches.com. Glamorous Gold – Next up, these super glamorous gold and black pumpkins feature glitter, chevrons and luxe metallic paint. What’s not to love? Sadly, I cannot find the original source for a tutorial, but I’ve seen several step-by-step guides for painting chevrons using specialist painter’s tape (masking tape) online. I know that FrogTape and ScotchBlue are both pretty popular brands for similar crafts. White & Copper – These white and copper pumpkins look brilliant – they’re so unique, yet subtle. Amy from HomeyOhMy.com shares her tutorial for achieving the effect, calling this the “easiest DIY” she’s ever shared! Amy uses actual white pumpkins (I didn’t know they existed, I assumed they were painted but perhaps we just don’t get them here in the UK, I’ve never seen them before?) Then, she adds a little bit of copper tape down the grooves of her pumpkins. Simple, yet very pretty. They’d make a great centrepiece for a Halloween dinner. Bright Ombre – Finally, who can resist an orange and pink neon ombre pumpkin? These would look fabulous in a modern style home. Love the effect? Read the tutorial on the “FunkyTime” blog. There’s also a pretty funky geometric print pattern to try on a butternut squash too. Love it. Thanks for the shout out! Great roundup. Those white and coppers are spectacular! Thank YOU for the tutorial & inspiration. I’m going to try my hand at painting pumpkins this weekend – cannot wait!